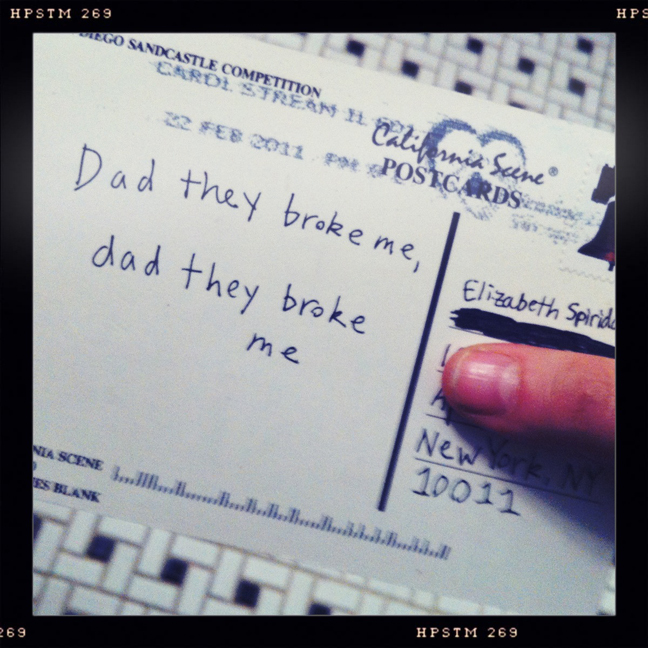 The postcard is San Diego, the postmark is Illinois, and all it contains is 2 lines from Pavement's Stop Breathing ("Write it on a postcard: Dad they broke me, Dad they broke me"). All it needs is a lock of Lady Gaga's nose hair taped to it in a pentagram shape and it would be the ultimate in Anon letters. But really..is this the best piece of postage of all time or should I be scurred? Stephen Malkmus, you can just call me next time. Thanks, secret mail friend ! That was a thrill. Labels: i heart the 90s, pavement, theenks, wha? Secret ex-boyfriend/lover stalker? As a reformed stalker (only on facebook, I swurr), I would say somebody is thinking about you a little too much! But as long as it's in the form of a twee little postcard, I say it's harmless no? Whaaaa?!! Oh, this is completely awesome. I have to know! Who sent this?? Ooh a secret admirer - quelle intrigue! Anything with Stop Breathing lyrics on it can only come from a good person, though, that's a fact. But to narrow it down, who do you know in Illinois that's a girl (doesn't look like a dude's handwriting). Could it be Tavi? AMAZING! I would die to get that in the mail! Stop breathing is the best. Stephen M., you told me you wouldn't do it! Ha! I would totally freak out! What an interesting post, thanks a lot for sharing. Thanks for this informative post .